The Early Access alpha release of Predestination has been in the wild for a while now, and it’s safe to say it’s been a hit with those who have tried it! Now that the dust has settled and we’re back into a steady development pace, we’d like to get back to writing regular updates for the Kickstarter and blog and catch you all up on what we’ve been working on. In this massive catch-up update, I’ll take a look at how the Early Access launch went, dig into our major Fleet Combat and Ground Combat update that’s set to launch in a few days, and look at our plans for the future. All of the changes discussed in this update will be going live with V 0.8.2.0, which we hope to be able to release both on Steam and our web installer by Tuesday 28th! Our main goal in releasing the Early Access alpha on Steam was to get some new faces testing the game and to help us as developers get some experience with deploying the game in a live environment. One of the biggest stumbling blocks that complex games like 4X games sometimes run into is developing the game without getting fresh feedback, so we’re been overjoyed to see the positive reception the Predestination alpha has recieved on Steam. If you still need a key for the alpha on Steam, please email earlyaccessrequest@brainandnerd.com with the email address you used on Kickstarter or Paypal. Alpha Updates: We’ve deployed several major updates to the Alpha since its release, as well as a number of smaller bugfixing patches. 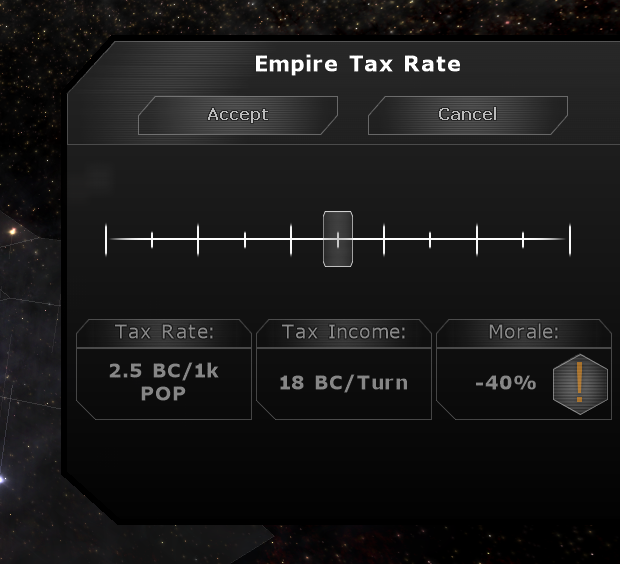 We’ve released the Adjustable Tax system that lets you trade off planetary morale and metal production to generate money each turn, and introduced the Empire Age option for map creation that lets you skip straight to the Space Exploration phase of the game! We’ve also revamped the research trees, added the morale and loyalty system that we’ll need when we introduce spying, and fixed some very tricky bugs. You can read the full patch notes of each of the updates on our Development Tracker thread. For those of you using the web installer who are stuck on V0.8.1.6, I apologise for the error and we’ll be deploying V0.8.2.0 to the web installer at the same time as we deploy it to Steam. Alpha Feedback: Feedback from the alpha has been great, and some brilliant discussions have taken place on the Steam forum. The feeling so far seems to be that the planet gameplay is fun, the ideas we have for further development are solid, and there are fewer bugs and errors than in other alpha games on Early Access. People also recognise that we still have a lot of major features left to deploy, and many fans are now looking forward to seeing more of the core features come to life. Even at this early stage, some players have said that they’ve already sunk over 100 hours into the game and have figured out some sneaky ways of optimising their planet setups. This tells me that we’re definitely on the right track, and that we have to pick up the development pace to get more features out in the open! The next update features a sizeable patch for the Tactical Fleet Combat portion of the game. This includes improvements to space stations and ground-based defenses, missile and drone improvements, and a few graphical updates. While working on the bombing and ground combat changes, we also discovered a number of serious bugs with Fleet Combat and its related gameplay that had to be resolved. Some details and screenshots of a few of the updates are below. All of these changes are scheduled to go in with V 0.8.2.0, which should be released in the next few days. 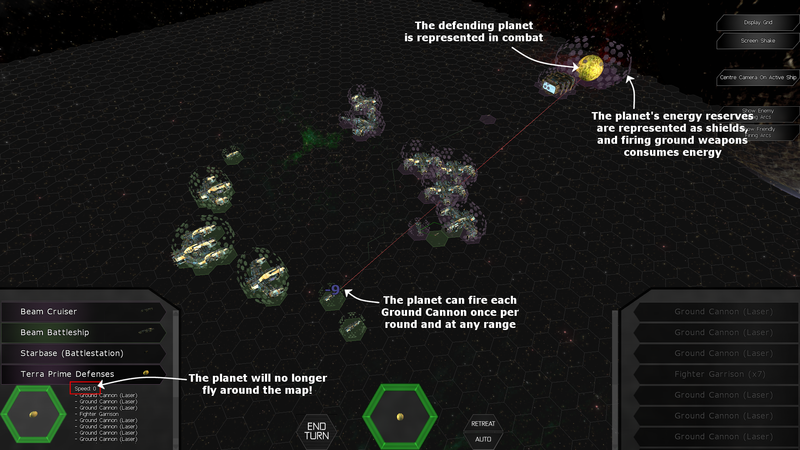 Planet Defenses: When you attack a planet that has ground-based weapons, the planet is represented in Fleet Combat. This may be a little confusing as the planet is also in the background of the space scene, so in a future update we plan to remove the temporary sphere model and extend the planet’s shield arc over a much wider area at the rear of the combat grid. We’ve fixed a number of issues with the planets for the next update, allowing them to fire their weapons at any range in exchange for energy from the planet’s reserves. The energy cost of Ground Cannon attacks has also been reduced so that they can really pack a punch during the battle, and we’ve now got missile bases and fighter garrisons working correctly. 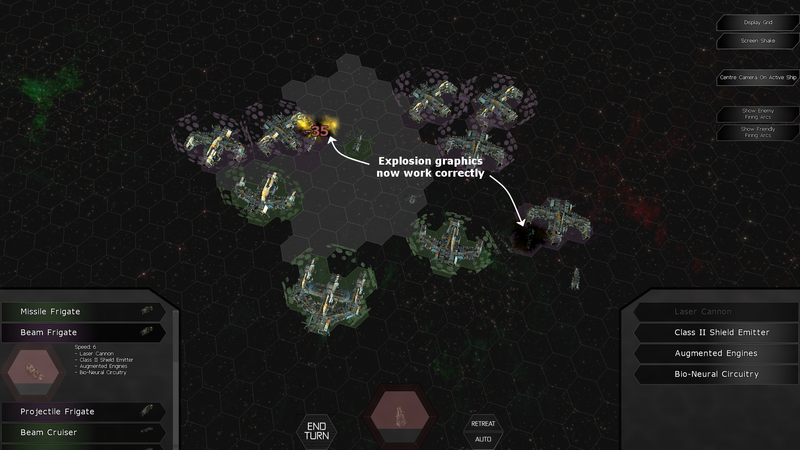 Bug fixes: We’ve fixed a critical bug in the Galaxy AI’s ship deployment algorithm that was sometimes bugging out and duplicating ships. We also ran into a re-occurrence of that crazy bug that made the planets and space stations start flying around the map, which was a difficult bug to crack because it refused to happen when I was debugging the code. Thanks to a few related crash reports sent in by fans, I was finally able to track the problem down to a simple mistyped variable name in the AI code and corrected the problem! Missiles also now have the correct speed (they inadvertantly had double speed), shields now recharge correctly between combat rounds, and the explosion graphics have been fixed and re-introduced. Weapon Ranges: To make space stations a little more deadly, we gave them a Structural Mount module that gives all of its beams and projectile weapons circular firing arcs and doubles their weapon ranges. This highlighted a problem with our old weapon arc algorithm, which has trouble with circular firing arcs at ranges of around 8 or higher and was causing a 2-3 second stall every time a space station fired. Our solution was to completely gut that code and build a new range system, which is now performing amicably. As a bonus, weapons with circular firing arcs and ranges over 6 will now have more circular areas and less hexagonal. 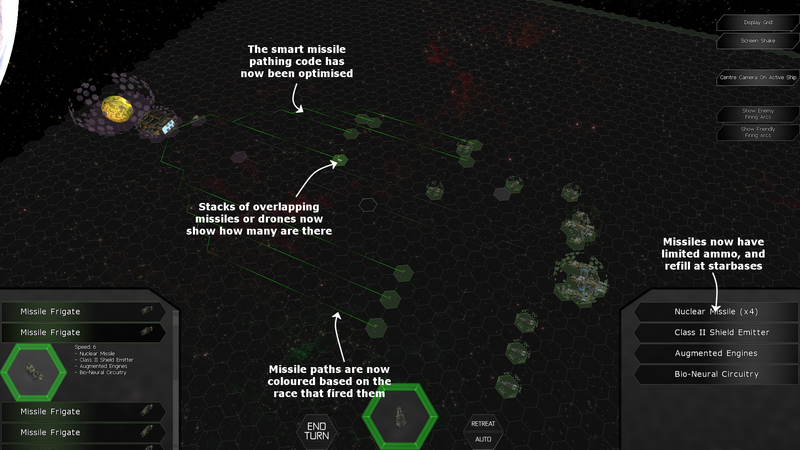 Missiles and Drones: Based on feedback, we’ve now coloured missiles and their paths based on the race that fired them so that you can tell which ones are yours and which ones are the enemy’s. We’ve also redesigned the missile AI and pathing algorithms, so missiles are now smart again and will no longer fly through your ships and blow them up! Missiles now start with 10 armour hitpoints and Drones with 25, and this is modified based on the best armour technology you have. The missile armour technology will also now add a Bytanium Armour Plating to each missile fired, increasing its hitpoints by a flat 35 points. Missiles also now have limited ammo and replenish whenever you visit a star system with a friendly starbase in it. And finally, when multiple missiles or drones are stacked in one location, there is now a number indicating how many are stacked together. The biggest feature in V 0.8.2.0 is of course the Ground Combat gameplay, which is something we’ve been talking about adding for some time. Ground Combat in Predestination takes place from the bombing interface, which is available once you’ve defeated any ships and stations defending the planet. 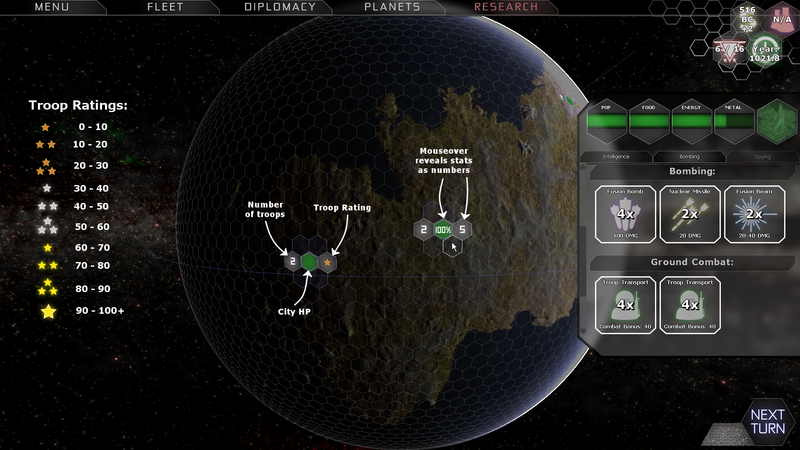 We’ve now implemented the ground combat and planetary conquest systems and overhauled the interface so that you can see all the relevant stats for each city right on top of it. How ground combat works: Ground troops have a combat rating between 0 and 100 based on the technologies you have, and the buildings in the city can add further bonuses. Cities automatically train a new troop every 5-10 turns and can have a maximum of 1 troop per 1,000 population in that city, and you can improve that capacity and training speed by building some military barracks. Once you’ve researched the Troop Pod module, you’ll be able to build a Troop Transport ship that contains 4 marines to drop onto cities one at a time. Your marine will roll against the defending troops one at a time until he’s either killed or kills all the defending marines, and once all the defenders are killed the city is yours! Slavery and population adjustment: One of the features we wanted to keep from MOO2 was the ability to capture another race and put them to work. Players used to capture Psilon planets in MOO2 to use as forced research facilities and take advantage of their racial bonus to research, for example. It took a lot of work under the hood and created a lot of new bugs that had to be fixed, but we managed to get the game to track the planet’s owner and actual occupying race separately so that you can now totally do that. When a planet is taken over, it will automatically get a -100% morale penalty and the population will go on strike. That penalty reduces by 10% per turn as the population adjusts to the change in leadership, and until then it’s still possible to lose the planet by rebellion. After the 10 turns are up, the planet is secure and will function just like one of your own. Contested planets: Planets in Predestination can currently only be owned by one race, and it’s actually a major technical hurdle to add multi-race planets, which is why we’ve always said that will have to wait until after release if we decide to do it. 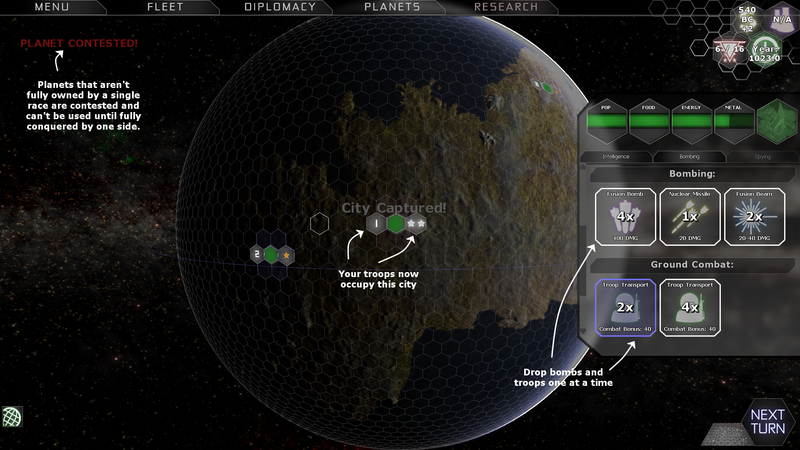 To let races fight over planets, we’ve introduced the Contested Planet mechanic. Once any city on a planet is taken over, the planet becomes contested and can’t be used by any race until it’s back under control. 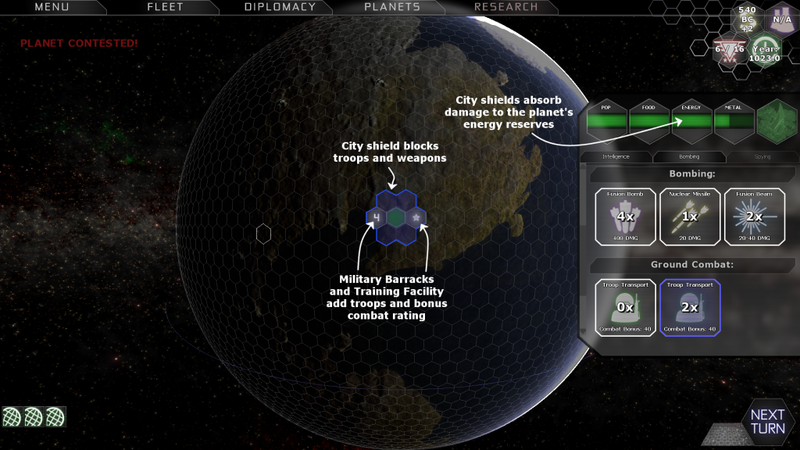 Once you conquer all the cities on a planet, the ownership will flip and you’ll be able to use the planet! Rebellion: One of my favourite features in the new ground combat gameplay is the Rebellion mechanic, which allows the defending population to rise up against their attackers. Every few turns while a city is occupied by an enemy force, the population has a chance of rising up and spawning a freedom fighter unit in the city, which will attempt to kill your troops and take the city back. If it’s successful, the victory will inspire other cities to fight back and gain +25 combat rating for 5 turns. The best defense against a rebellion is to drop a few reinforcements into each city so that they never run out of troops. Bombing changes: As part of the ground combat changes, we implemented some tweaks to City Shields and made them visible on the planet’s surface. After some testing, we decided to make a few changes to the bombing gameplay. City Shield buildings no longer stack, so instead each city will use only one shield building. Standard Beam and Projectile weapons can be fired once each round against cities on the planet and will deal between 100% and 200% of their rated damage. Missiles can be fired multiple times in a single turn but now have limited ammo and will deal exactly their rated damage plus or minus 20%. Finally, bombs now deal hundreds of damage to help cut through the City Shield’s block amount, but each bomb weapon carries only a single unit of ammo. A new Bomber ship design has been added that carries two of your best bombs. As mentioned above, ammo is refilled by visiting a system with a friendly starbase. Bombing UI: The overhauled UI now lets you quickly see which cities are protected by shields and how many hitpoints a city has. A big change over the previous versions is that Infrastructure and roads are now all hidden when you’re bombing and all you can see is the cities. This has been done in preparation for our eventual release of the Spying gameplay; One of the spying missions will be to steal maps of the planet and reveal all of the planet’s infrastructure and stats. That will let you pull off a surgical strike, such as cutting off the planet’s power supply to drain the shields over a few turns rather than wasting bombs on it. The AI will be unable to rebuild destroyed infrastructure while the planet is contested, but the cities will continue to rebuild based on their selected blueprints. We plan to deploy all of the above changes in V0.8.2.0 and hope to have that update ready by Tuesday 28th. Once that goes live, we’ll work on several minor patches to address bugs and crash reports and implement any quick changes based on feedback that we can. Once the game stability and feature polish is definitely up to an acceptable level, we’ll begin work on features for the next major update. The plan is to implement Diplomacy, Freighters, Trade Routes, and finally add all of the building models we’ve been working on. Those of you waiting for the 3D ship designer will be glad to know that that’s high up on our agenda after this update. Freighters: You’ll be able to build Metal, Food and Energy freighters in your shipyards that can load resources at one planet and unload them at another. You could use this to deliver metal to a new colony to kickstart its development, or to send energy to a planet under siege that needs its energy reserves topped up. You could even just use it as extra storage to stockpile metal in case you need to build ships in a hurry. Trade Routes: Trade routes are a way to have metal, food or energy transferred from one planet or star system to another on a regular basis. You’ll be able to pick a comoddity to export from the planet Services panel, select a destination planet, and then decide how much of the material you want to send each turn. Civilian ships will then begin sending convoys from that system each turn, which will then arrive in the destination system every turn. The trade route will continue to operate until either the resource runs out on the originating planet or enemy ships blockade the origin or destination. Diplomacy: Diplomacy is one of the big features everyone’s been waiting for, and will help put a face on the other races in the game. We’ll be adding the first phase of the Diplomacy system in V0.8.3.0, which will allow you to contact other races and propose trades and deals. You’ll be able to ask for a Trade agreements, Research treaties and non-aggression pacts, and exchange technologies and freighters filled with resources. The first phase of the Diplomacy AI will be able to evaluate your proposals and make a decision, and we hope to implement the Diplomacy user interface and a favour system for this update. The next phase will include AI algorthms to counter your offers, make its own proposals and demands, and a memory system so the alien races remember your duplicity or your trustworthiness as the game progresses. Building Models: The time has finally arrived when we’re nearing completion of our building models. We’ll have an art update published soon with screenshots of the buildings and details of our texturing process and how we’ve progressed. When all the building and infrastructure models are finished being textured, we’ll then release them into the game as one big update. Thanks for reading this development update, and I hope you’re looking forward to the update. We’re aiming to deploy this update by Tuesday 28th if everything goes to plan. If you’re a pre-order backer or greater and would like to get into the Early Access Alpha either through Steam or via our own web installer, send us a mail to earlyaccessrequest@brainandnerd.com with your Kickstarter or Paypal email address or details of your purchase and we’ll get you sorted out as soon as possible. Tagged 3d, 4x, bombing, devblog, development, game, game design, game development, game-design, gameplay, graphics, ground combat, indie game dev, indie game development, master-of-orion, micromanagement, moo2, planets, predestination, screenshot, screenshots, space, tactical-combat.